Occasionally, there is something to be said for an album that 'just gets it right', regardless of any lack of innovation, subtlety or nuance that one might often associate with the top shelf recordings which define and shape their genres. 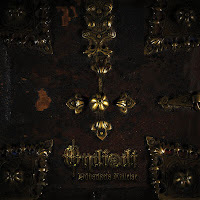 For 2019, Finland's Ondfødt has crafted one such effort which succeeds entirely on its sheer power and production, a record that, played at high volumes, seems like it's just gotten everything right that it wanted to, and is thus a pleasure to listen to. One of those rarities I can sit through a number of times, not really pick out any spectacular riffs or highly catchy melodies, and still come away from thinking I've just had my soul crushed in a memorable fashion. Not a sound on Dödsrikets kallelse sounds like it belongs in a post-1996 black metal universe, and yet it's one of the better albums in this style I've heard in the last couple months. Now, I don't wish to infer that, by their adherence to very traditional riffing, that this album lacks for dynamics, because it shifts pretty evenly between mid-tempo, late 80s Bathory bravado, faster breaks and a few atmospheric flourishes with acoustic guitars or sublime melodic passages that give this whole affair a very complete, rounded polish. 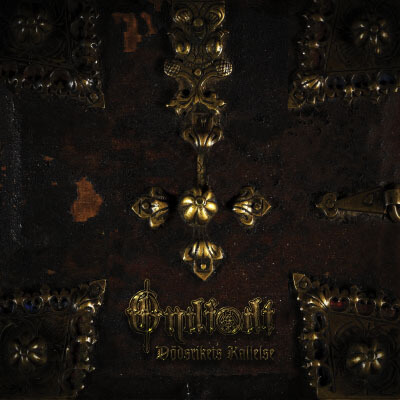 The parallels to other Scandinavian masters such as Darkthrone and Immortal exist, to the point that Ondfødt at no point even flirts with originality, but when you hear the bold, bruising rhythms they're churning out, you're easily swept away to the aesthetic imagery that categorizes such black metal: cruel hearts and cold wastes. This isn't an album with a lot of evil note progressions, or one that uses the smokescreen of rawness to masque its lack of competence and devotion...Dödsrikets kallelse sounds enormous, whether its battering you with a wall of chords that sound like weaponized glaciers rolling around on tank treads, or picking up the pace for a blasted windswept melody. Drummer/vocalist hammers away like a winter battalion chopping wood for its campfires, while his huge rasp hovers just above the rhythm guitars, raving over the musical blizard with just the right depth and sustain. It's the sort of album where, even when you know where the guitar line is going the first time, you want to take the journey anyways. They help break up the steadier riffing with some thunderous breaks, where the chords are reduced to just bludgeons over the beats, reminiscent of fellow Finns like Barathrum, Ajattara or Horna, so in summary they seem to channel influences from all over Northern Europe. The aforementioned atmospheric parts, like the ritualistic intro to "Den sista färden" or the glistening, sad acoustics that permeate instrumental "Dödens dröm", are perfectly placed pauses in the action that help amplify the emotional resonance of the whole disc. It's one that rewards you for sitting through the beginning, middle, and end, even if the latter is a cover of another obscure Finnish act known as Hämys using a cluster of gang vocal rasps. At around 35 minutes, this album never even comes close to wearing out it welcome, there isn't a riff on it which lasts longer than it needs to and the shorter duration is a good fit to the simplicity and straightforwardness. Just a great sophomore effort, and a fine fit for this time of year.